Don’t let those curls get the best of you. It’s time to take control of your hair and you CAN with the right styling products for curly hair. With the right combination of products utilizing tried and true techniques, you can have tame curls or voluminous curls based on the look you want! Here are some helpful tips to show those curls who’s boss! Having lasting results requires consistent methods of hair care. Good hair care products are a must, but if you only use them every now and again, you will not maximize their benefits. Get the most out of your products by using them consistently. Cleanse your hair at least once a week, follow with a healthy conditioner, use a leave in moisturizer and then you are ready to style. When styling curly hair, use gentle products that will NOT cause a build up which hinders the styling process and can greatly impact your results. Products that are near the pH balance of your natural hair are better at ensuring the results you are looking for. CURLS Products for Curly hair are an excellent product brand for caring and styling your hair. 3. Use the smooth or shake method to achieve the best results. When styling your curls, you have options. Use the Curls Curl Gel-les’c for voluminous curls. Apply to your strands after cleansing and conditioning by smoothing along the hair shaft. Once dry, shake your hair for more and more volume. For smoother curls, utilize the Blueberry Bliss Curl Control Jelly and smooth along the hair shaft with “prayer hands” for well defined, frizz free curls. Finish either look with the CURLS Passion Fruit Curl Control Paste on your edges and/or ends for definition and medium hold. 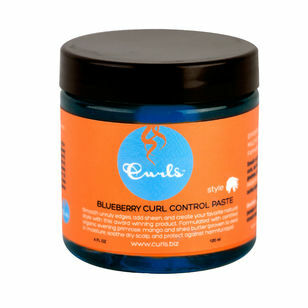 For maximum hold, use the Blueberry Bliss Curl Control Paste. These techniques along with these high caliber products will have your hair in its best condition and on it’s best behavior!